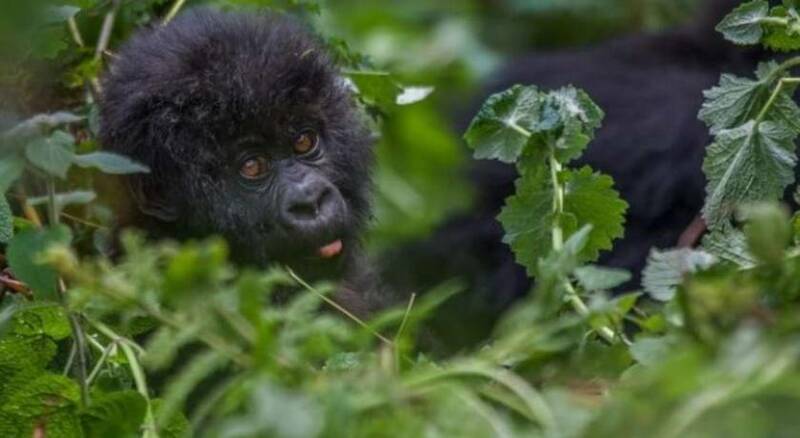 Use the form below to Inquire More or Reserve Uganda & Rwanda Exclusive Gorillas Trek. How much is 8 + 5? Locking eyes with wild mountain gorilla in their natural is one of the most exhilarating experiences one can have on planet earth. Meet mankind’s closest relatives in Rwanda & Uganda, while enjoying authentic cultural activities, wildlife safaris, guided forest treks, and luxury accommodation. Travel deep into the heart of the continent with this exotic adventure presenting some of the world’s last mountain gorillas. Led by private expert guide, journey through the “Pearl of Africa,” Uganda & “the Land of a Thousand Hills,” Rwanda to visit mankind’s closest relatives. Explore the wild jungles of Lake Mburo, safari through the ancient rainforests of Bwindi & follow in the footsteps Dian Fossey in the Parc National des Volcans. Featuring a trip to the equator, drum ceremony, Kigali’s heart-wrenching Genocide Museum & more. Enjoy as a standalone Africa tour or as an addition to a safari. NOTE: Gorilla permits are secured with you trip’s deposit. Once secured they are non-refundable. It will take 24-48 hours to secure the purchase from the authorities as they are sold on a first come first served basis. The park authority/management reserves the right to cancel any permit without any refund or further reference. Welcome to the East African primate capital, the heavily forested country of Uganda! Upon arrival to the Entebbe International Airport, a representative will meet and load up your entire luggage and head towards the Ugandan capital city of Kampala where you will overnight. The elegant Serena Hotels continuously outdoes itself, and its location in Kampala, Uganda, is no exception. With rich green foliage framing the hotel’s façade, each of the 152 rooms look out on the 17 acres of garden or allow yourself to grow mesmerized by the 7m waterfall on the pool terrace. The hotel’s rooms each have an individual personality, working with cultural artifacts, native wood carving, and contemporary Ugandan design at its foundation. Dining is a fluttery, fairytale-like medley of bursting flavors and delights, from freshly squeezed exotic juices to Italian cuisine and of course, very impressive world cuisine. Make sure to stop by the Maisha Health Club and try out the skin treatments. Revered across Kampala, it is relied on by all who trust in the Serena Hotels name. Depart the Ugandan capital of Kampala en-route to the Lake Mburo National Park grounds. Set out on an adventurous game drive around the Lake Mburo National Park grounds today. The eco-diversity of this park makes for quite the journey as you explore some of the many hillsides, grasslands and water based wildlife habitats. To hone in on the specific wildlife one would want to see, the park has designated routes or “tracks” which travel to the specific landscape where these wildlife species thrive. Travelling along the “Zebra Track” will boast a variety of plain-game including Burchell zebra, bushbuck, oribi and reed buck. To find species like the elusive klipspringer one would have to travel along the “Ruroko Track.” This track is home to wildlife that requires a habitat that features a wetland basin surrounded by thick acacia shrub and woodlands. Your park fees are included for this day. The exclusive Mihingo Lodge is a peaceful retreat which strategically sits adjacent to Lake Mburo National Park. The property features ten tented rooms which have been built on raised wooden platforms that are covered by a thatched roof. Suspended under the thatched roof is a spacious and comfortable tent which has been equipped with safari style amenities and facilities including en-suite bathrooms that produce both hot and cold running water for the shower, and flushing toilets. The property also features a large dining area and an infinity pool. Enjoy your private transfer from Lake Mburo National Park to Bwindi. Often referred to as the Bwindi Impenetrable Forest, this area boast some truly thick vegetation consisting of massive evergreen trees that stretch to great heights for sunlight. It is here within the Impenetrable Forest where almost half of the world’s population of Mountain Gorilla reside. The travel time between these two diverse locations is approximately 6 to 7 hours depending on weather conditions. In the afternoon, enjoy some time on your own to relax. 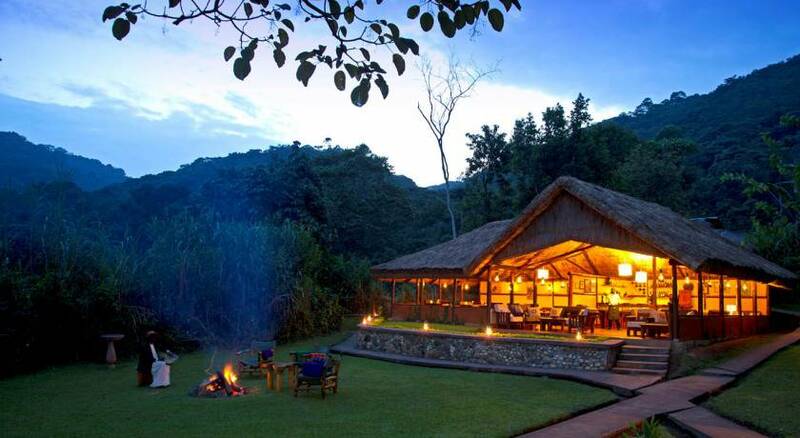 Sanctuary Gorilla Forest Camp is nestled deep inside Bwindi Impenetrable Forest, a UNESCO World Heritage Site in southwest Uganda. This camp is one of the most remote and atmospheric in Africa. The main area features a comfortable lounge and bar area as well as the main dining area while the mini spa offers a wide selection of treatments. Located within the National Park, Sanctuary Gorilla Forest Camp offers guests an unrivalled location, including the best bird and wildlife viewing in the Bwindi area. In fact, Sanctuary Gorilla Forest Camp often receives regular visits from the gorillas themselves. For the lucky guests in camp at those times, they may have the chance for a gorilla encounter without even leaving Sanctuary Gorilla Forest Camp. 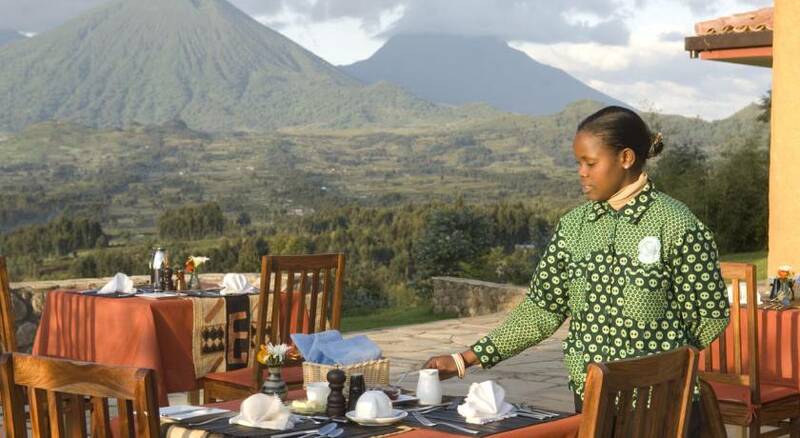 Wake up very early and depart with a picnic lunch to track the rare Mountain Gorillas (hiking boots required). The tracking may take between 5 and 8 hours. 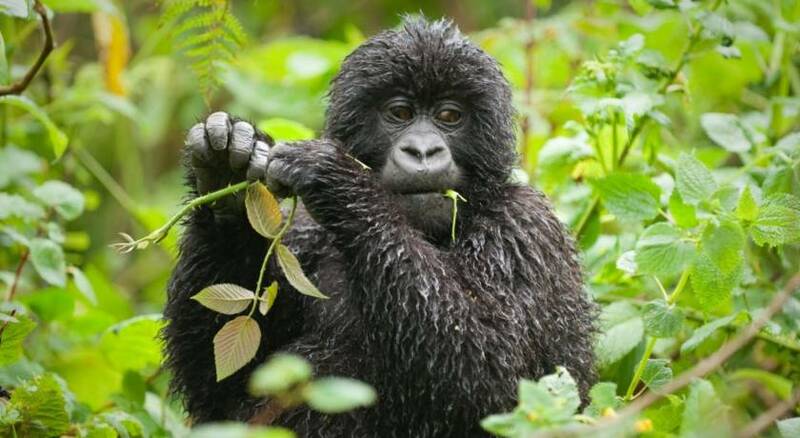 The Park Guides with you interpret the flora and fauna and the lifestyle of the Gorillas. Return in the evening for dinner and overnight at the lodge. Only persons age 15 and over are allowed to track the gorillas. Travel today between Bwindi and Parc National des Volcans by private car and english speaking driver. Enjoy a box lunch while you travel (included in tour price). 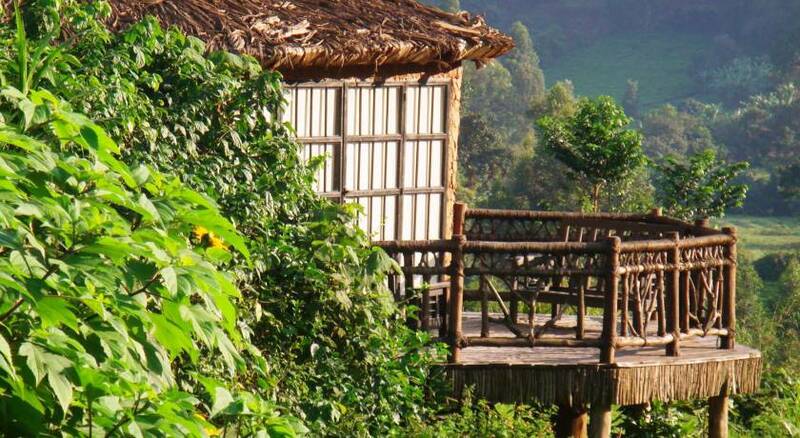 The Sabyinyo Silverback Lodge is conveniently placed at the feet of the Virungas, the striking volcano mountains through which so many hike in order to catch a glimpse of mountain gorillas. 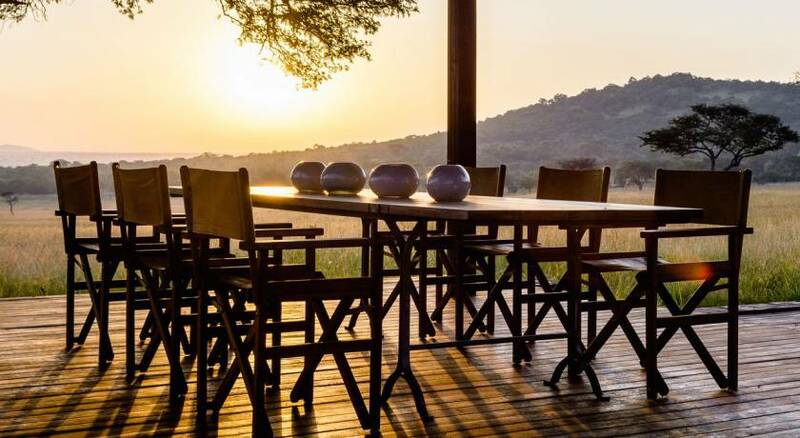 The 8 cottages and suites are structured so as to give guests the most all-encompassing view, promising privacy, a vast countryside, and beautifully decorated quarters. Dining is a similarly pleasing experience, with a variety of fare meeting the standards of even the most discerning traveler. Staff here are extremely helpful, all possessing a very caring nature, and a willingness to assist guests. Besides visiting the famed mountain gorillas, be sure to check out the local marketplaces and find out more about local community projects. The Parc National des Volcans is located in the Virunga Mountains, a magnificent chain of dormant volcanoes in the North of the country. This area is home to the world’s last surviving mountain Gorilla populations, currently a mere 700 individuals. After breakfast you will depart the lodge and drive for approximately 1 hour to the Park Headquarters where you will meet with excellent local guides and trackers who will provide an informative session on the etiquette of gorilla trekking. After the session the hike into the forest begins. A full day trek with your guide through the park is a reasonably strenuous activity which can last the morning or all day as you seek out the gorilla families. The guide will take you to where the gorillas were seen the night before and begin to track them from that point. The trekking can take from 1 to 6 hours and climb to altitudes not in excess of 7,500 feet. The terrain is rough and at times quite muddy. Once the gorillas are located all the aches and fatigue of the trek are forgotten, as the experience is often described as finding a hidden natural treasure in the mist. Viewing time is limited to one hour, and only 8 maximum are allowed per group. Visitors are asked to maintain a distance of 7m (about 22 feet) from the gorillas. Cameras and plenty of fast speed film are recommended. It can rain at any time in the forest, so waterproof clothing is recommended for you, your cameras and film. Please note that plastic (e.g. carrier / shopping) bags are illegal in Rwanda. Kids under age 15, or people sick with a cold, flu or other contagious illness, are not allowed to visit the gorillas. PERMITS MUST BE PAID IN FULL AT TIME OF CONFIRMATION AND ARE NON-REFUNDABLE. 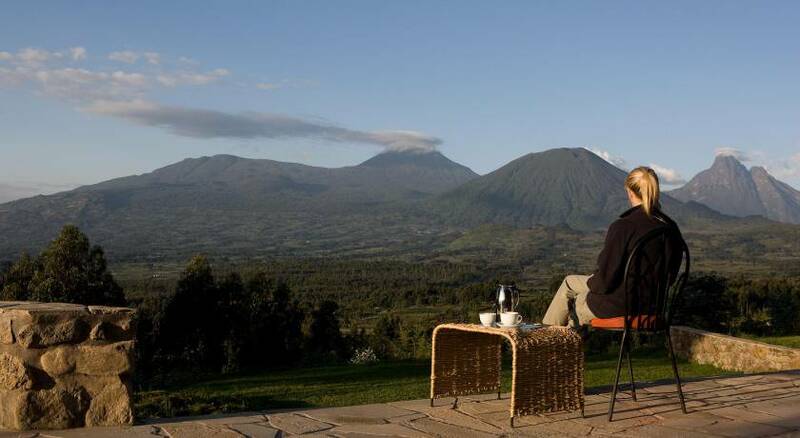 A private vehicle with English speaking driver will provide a transfer today from Kigali to Parc National des Volcans. The approximate travel time is 3 hours. Prepare your senses for an explosion of culture and emotion during today’s excursion through Kigali. Begin by visiting some of the popular market places to view and purchase some of the local products. Next, you’ll travel to a location stained with heart aching cultural history, The Kigali Genocide Memorial Centre. This tragic memorial was constructed in April 2004 to honour those whom lost their lives during the Rwandan Genocide. The centre was built on the site where an estimated 250 000 victims were buried. This location serves as a place where individuals can grieve the loss of their loved ones and to provide educational information regarding the genocide. Rwandans believe that although the gruesomeness and painful emotions associated with this tragedy may be construed as negative, it is extremely important that the younger generations of Rwandans fully understand the reasons and effects of such an event on a nation. The Centre features three permanent exhibits which depict the events of 1994, as well as a children’s memorial which exhibits the history of genocidal violence towards children from all over the world. Enjoy your private transfer between the airport and hotel.